This is what happens when I pull out my quilt photo album.... 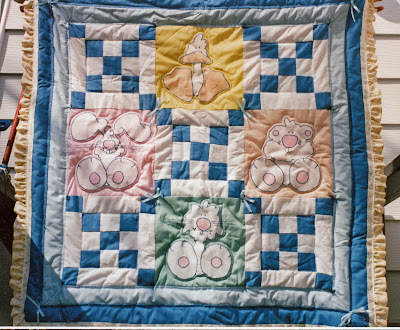 I just HAVE to share pictures of 'quilts of the past.' 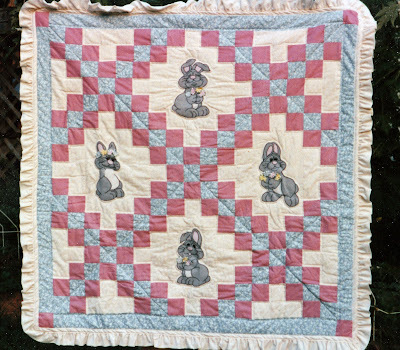 These are some of my favorite baby quilts. Pam selected a wallpaper border for Alan's room. I used it as a pattern for his quilt. 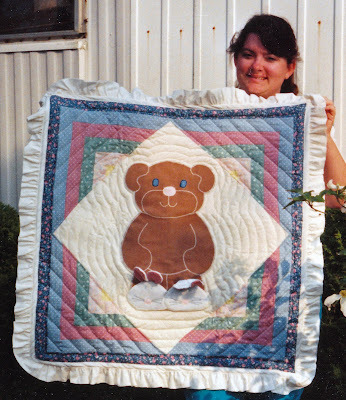 This was the first real quilt I ever made! I was so intimidated by this project, but so eager to give it a try. I think it turned out pretty cute...if I do say so myself! =D Alan just started college last week, so that gives you an idea how long ago this was. Next came Levi's Bear with bunny slippers. 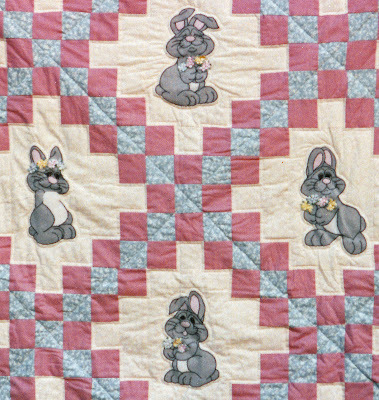 This was a fun quilt. 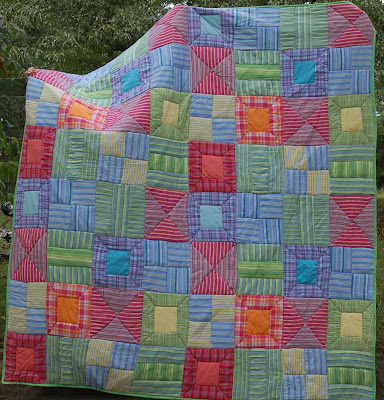 As you can see, I got more brave & added lots more quilting. I just love the wee little bunny slippers on the bear. 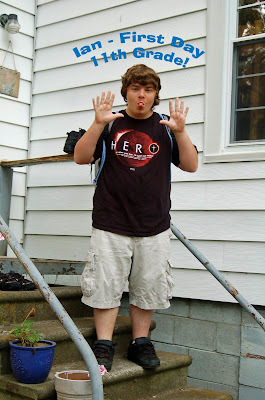 Levi just started his senior year of high school...so yes, that is me - approx. 18 years ago. 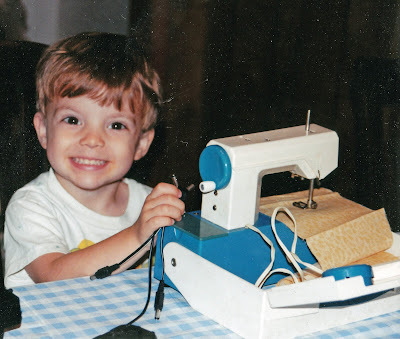 As Cole grew, and Ian started to school, I attempted to do more sewing, crafting & quilting. As a baby, Cole was content to sit in his bouncy seat on the table next to me as I sewed. But as a toddler he want to HELP. He would climb up in the chair behind me, climb on my back like a monkey, hanging over my shoulder to watch as I sewed. This is not the best way to sew...for either of us. So I found my old toy sewing machine. I took out the needle, plugged it in, and let him have at it. He loved it! It made noise, and pulled the fabric through just like Mama's sewing machine. We were sewing together. Funny story - he was sewing, but didn't have the fabric close enough to the feed-dogs for it to move through. I told him to get it closer to the feed-dog.. He paused, looked at me with a funny look, said 'okay Mama', and got up & went outside. I peeked out the window and much to my shock & delight saw him FEEDING THE DOG!!!! That's my Cole! I found this old picture & had to share. As you can see, Cole was quite a bit younger.... this picture was taken December 2005 - before we had a digital camera. 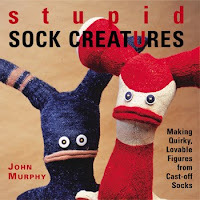 I stumbled on a book called "Stupid Sock Creatures"
& knew that would be the answer to Christmas presents for my various nieces & nephews. The book doesn't have patterns or exact instructions. It's more of a general guide on how to make your own creatures & encourages you to let your imagination run wild. So I did! It was a lot of fun playing with the various socks/color combinations, and coming up with wacky creatures. 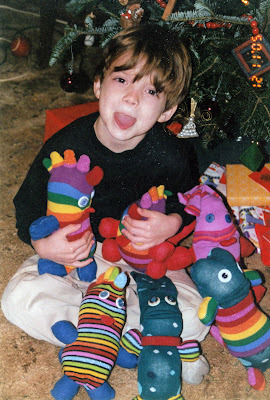 Cole latched on to one, named it 'Flapper Tongue', (the smaller one in his hands), and STILL has him. It's not Smuckers, but we think it's still pretty good! 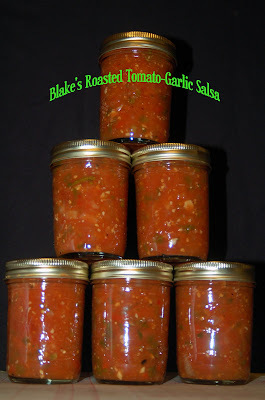 Blake is King of Jelly and Salsa! 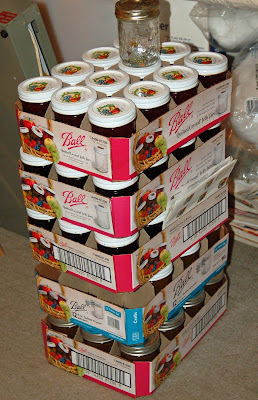 He's canned so much jelly & salsa we're running out of room to store it. It's invading my sewing room space. Grrrrr! 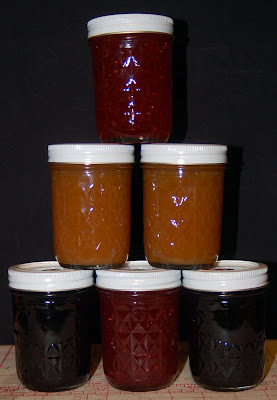 So far, he's made 5 cases of strawberry, mulberry/blackberry, peach jelly, fig perserves. And this weekend he added 2 1/2 cases roasted tomato-garlic salsa. We have jelly and salsa coming out of our ears!!!! But as icky as that sounds - it's a good thing. All this will be family Christmas presents in a few months. Mmmm, chips & salsa. Yummm, biscuits with homemade jelly. I've been procrasting on finishing my niece Courtney's quilt. 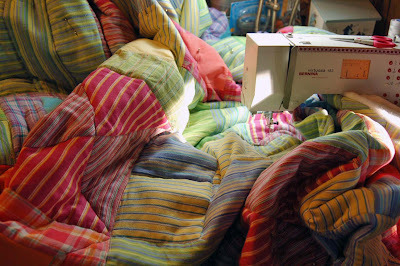 It's a beautiful quilt and I have no grudges against it.... I think I let the size of it intimidate me. King sized quilts will do that to ya! So this weekend I took it in baby steps. Friday I cut out all the strips for the binding, pressed them & prepared them to be joined at a miter. Saturday morning I sewed the strips together. Then without thinking, planning or making excuses, I just decided to dive in & tackle it. I sewing the entire binding on - all by machine - on Saturday afternoon. Now I'm very happy to say It's Done! What a nice statement...it's done. We took pictures of it this afternoon. Can you guess which side Blake is holding up & which side Cole is holding???? 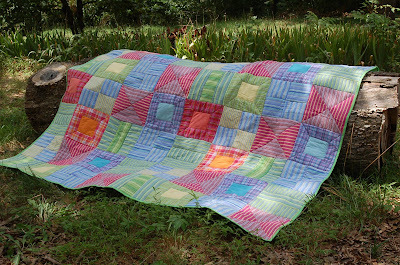 I 'stitched in the ditch' (via freemotion quilting)all over the quilt. Everywhere 2 fabrics met, I quilted. 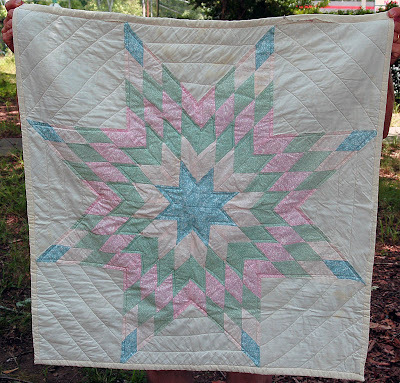 As you can see from the back - it's nothing real fancy, but it's a lot of quilting. 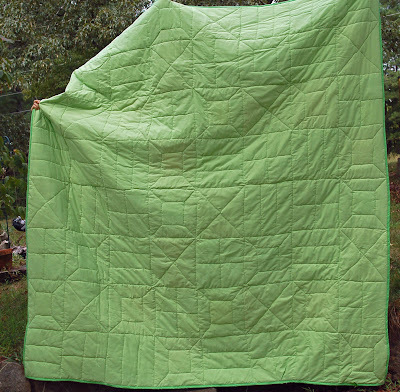 I used a king sized sheet for the backing, and some bright green fabric for the binding. 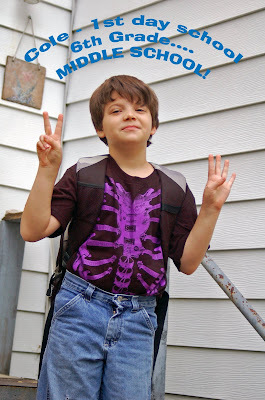 August 6th - the First Day of School...the boys were not impressed, thrilled or otherwise joyful. Summer went by WAY too fast. I think they still had plans...plans to sit around all day & do nothing, plans to watch more movies, plans to play more X-Box, plans to munch more junk food, plans to make plans. But the schools had other plans...So off we go ~ during the hottest part of the year. No more plans - because now is the time for action! Ian's life will be busy with early morning First Priority, after school band practices, and Friday night football games. And Cole's life will start a new chapter - middle school, and all the ups & downs in that wonderful pit of hormonal despair. But Cole is really excited about one thing - he's started band now, too. So soon we'll have the sound of a beginning saxophone player wailing, squeaking & hooting around the house. Sometimes the magic works, and the button gets pushed at exactly the right moment. Thank you, Rachel, for helping me freeze such a cool 'EPIC' moment in time. We who are about to be YUCKED salute you! 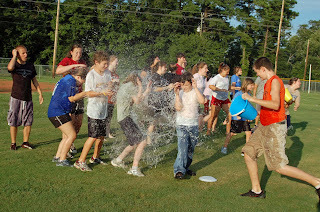 First you get good and wet in the 'HURRICANE GAME'. NExt we add a little slime, thanks to the Egg Drop. You have to crack the egg & drop it into the little cup. Now we 'made some biscuits' with our messy, slimey, wet faces. They have to find the M&M candies hidden in the plate of flour. Jacie's method was to BLOW the flour out of the plate! Cole's method of cleaning up between games. Next is 'Redneck Paintball'. A large marchmallow is dipped in goo...nacho cheese, chocolate pudding, mustard, etc, and then your fling it via a plastic spoon at your designated team-member target. This too turned into a massive food fight. John looks like a man on a mission - determined and focused on revenge! Now we move on to the "Zit game." One team member is given a peanut butter 'facial'. Then the team tosses mini-marshmallows at them. The one with the most 'zits' wins! Dusty was a marshmallow magnet! Rachel taken a clean-up dip & toss. Now the icky-ist, gaggy-ist game of all! "Calf Snot Shots"
I drew the line at photographing kids tossing their cookies...but you get the idea. Finally, some good ol' slip & slide fun! What a crazy, fun, icky, slimy, messy, gaggy, night! And these pictures are just the tip of the iceberg! 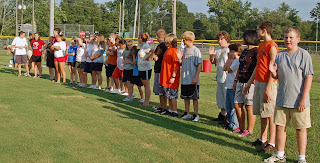 FBCLS Uth Rock!! !